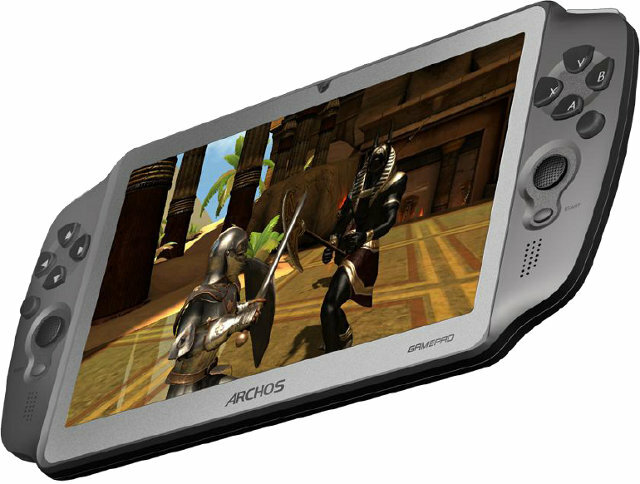 Many android games now use virtual buttons on the touchscreen for control, but this may not be optimal for all types of games, which is probably why Archos announced the launch a new type of tablet called the Archos GamePad just before IFA 2012. This device would just be like any 7″ Android 4.0 tablets were it not for the control buttons and analog stick on both sides of the screen. The GamePad is powered by a dual core processor @ 1.5 GHz with a quad core Mali-400 GPU (most likely Rockchip RK3066) with 1GB RAM and 8GB Flash. Android 4.0 supports game controllers within its framework, and by making use of this framework, the GamePad can support many games. However, lots of games still do not include physical control mapping, so Archos developed their own mapping and game recognition tool, which allows any virtual controls to be mapped to the GamePad physical control buttons. This currently allows the GamePad to be supported by thousands of games, according to Archos.